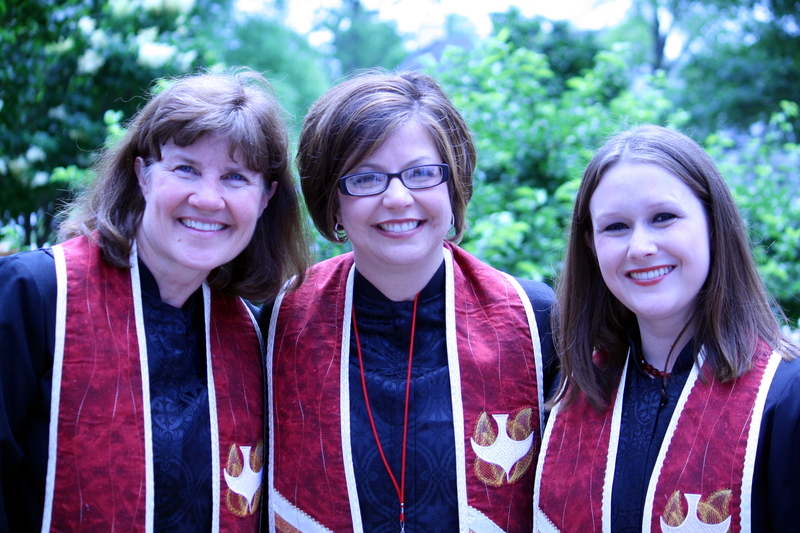 Three Indiana United Methodist clergy on their ordination day. At the time I thought: “OK. This is a matter which we can agree to disagree. Some churches are simply going to see this differently. It’s OK that some accept and some don’t.” In short, I thought including women at the highest levels of leadership was optional. 1. First and foremost, I believe that good biblical theology and hermeneutics (a fancy word for principles of interpretation) demand it. I’m not going to recreate the theological arguments here. I think the best job on this has already been done by N. T. Wright. But let me give you a few clues as to how we’ve often gotten this so wrong. The New Testament is one of the most progressive documents in the ancient world on women’s issues. The authors never challenged the patriarchal system of headship because this was the legal designation of their day and there was nothing that they could do to change that (few [none?] of the early Christians had the necessary political standing). So they elevated women within the legal system that they had to the highest levels of legal leadership. We don’t have legal (or even cultural!) prohibitions to women’s leadership so we have the opportunity to carry out the biblical vision of equality of all people within the Kingdom of God. We have a biblical mandate to do that. Update: Some have said that my article made no biblical argument even though I linked to one. So I decided to do a short series that explains the biblical argument for women at all levels of leadership. Please read The Bible Says Women Should Lead – Part 1 for all the Scriptures that show women in ministry, read Part 2 for a reading of the relevant passages in 1 Corinthians, or read Part 3 for relevant passages from 1 Timothy. 2. Secondly, the culture has shifted so far on this issue that we have exchanged our place as the socially progressive institution that we were for generations for the place of a culturally backward one. Now the church may have to be “culturally backward” on some issues because culture sometimes simply goes in a wrong, immoral, and untruthful direction. On this issue it seems clear that culture has gone in the right direction and the church’s insistence otherwise is a great discredit to her (the church is historically spoken of in the feminine) ministry. We are increasingly pushing ourselves to the margins of culture. 3. This is a justice issue and much of the church has gotten it wrong. What is actually happening in most churches? Women are in leadership. They are leading classes, organizing service and outreach, organizing fellowship events, and managing the day to day operations. But when the real decisions are made- the ones that people with influence want to be the ones making- women are excluded from the conversation. It is unjust to use women’s ministry gifts but to then exclude them from leadership decision-making. Some churches have an explicit practice of doing this. Others do so in practice as the real decision-making gets moved to the meeting after the meeting that takes place in the parking lot. If you are from a denomination that ordains women and otherwise affirms their leadership, it is still time to ask whether they are genuinely been given all of the leadership opportunities of men. In the United Methodist Church, one of the places most welcome to women’s leadership, men are 6 times more likely to be appointed to a church of 1,000 plus members. Women are 10% more likely to leave ordained ministry than their male colleagues. And 1/3 of women clergy serve somewhere other than a local church (GBHEM, Clergywoman Profile). This is a justice issue. 4. It is time to raise up a generation of women to share in equal leadership of the church. I serve as the Director of the Lantz Center for Christian Vocation at the University of Indianapolis. The two main functions of our work are to help young people discern God’s call to ministry in all kinds of career fields (health care, social work, science, accounting, etc.) and to train those that are called to church ministry (pastors, youth ministers, missionaries, etc.). It is a regular occurrence for me to meet really gifted young women that I’m convinced God has called to pastoral ministry. Increasingly, the young people that I meet that are the most gifted for church ministry are women. The women simply are (generally speaking) better formed for spiritual leadership than the men are. I’m sure that I will provoke some gender stereo-types here, which is why I gave my parenthetical remarks above, but the current church in America is weak on theology and weak on adventurous mission. Many of the men that I know that have sensed a call for pastoral ministry is because of a passion for theology or radical mission (culturally conditioned or biologically conditioned, this is the motivation that I’ve often noticed). The church in America has been much better at forming communities that are healing, redemptive, and oriented toward spiritual growth. Many women that sense a call to ministry sense that call because of a passion for this kind of community. That is my analysis. It is anecdotal. But I can simply say that my observation as a professional that works in this critical area everyday is that the young women that I teach and pastor are (generally speaking) more ready and gifted than the men to accept a call to ministry. I’m very concerned that many of the women that are most gifted and prepared to enter church ministry are unwilling to accept that call. Some of them will say that they don’t believe women should pastor. Some of them think it but don’t say it. Others subconsciously “know” it but would not be able to articulate it. They “know” it because their church implicitly or explicitly taught them this. Their churches never allowed a woman to speak unless it was on “women’s” issues. The youth rallies that they attended were the same. That just isn’t what women do where they come from. (I wonder if implicitly some of them wonder if no good Christian man would marry them if they were a pastor…because they would be too “powerful” to be able to be “led” by him.) If the church is going to go forward into life and health in an age when the church’s ministry is at a critical place culturally, then we need these powerful young women to be inspired by other women pastors to be the pastors that God has called them to be. If you think this is a fabrication, two of three women in the picture above only entered ministry as a second career and only then with significant hesitation. That had to be convinced by others that they could in fact be pastors because they had been excluded from leadership at an earlier stage. I no longer believe that women’s inclusion in all levels of leadership is an option- it is a must. It is biblical. It is culturally necessary. It is just. It is needed for the church’s future. What can you do to affect change? If you have the power to influence policy, change the structures that prevent women from leading. If you have a voice (teaching, preaching, mentoring, blogging, etc), then use it to inspire young women to leadership and to advocate for change. If you are planning worship, a conference, or other event, invite a woman to preach (and not just about women’s issues). In fact, invite equal numbers of men and women to speak. Do what you can to empower and encourage young women that are considering ministry with prayer, finances, etc. Women clergy are prone to much higher drop out rates than men clergy too, so encourage the female pastors in your life. The Assemblies of God has been ordaining women since the beginning in 1914. Unfortunately, some of congregations have not gotten on board and our free church ecclesiology allows them to stay that way. In some ways, we have a long way to go as well. I hear something similar from the breakaway Methodist denominations like the Wesleyans. They will ordain women, but it is almost impossible for those women to find employment and live out their calling. I think your point about Wesleyan denominations is exactly right. I actually think the same problem is present even in liberal denominations that are on a call system (UCC, Disciples). One good argument for the episcopal system is to protect good pastors from discrimination. I’m Nazarene (one of the “breakaway Methodist denominations”!). We have ordained women since (before!) our founding (a quarter of a century before the UMC began ordaining women). I would agree with the critique about women finding an actual ministry position. On good thing for The Wesleyan Church, not only was JoAnne Lyon elected as one of three general superintendents, when they restructured the denomination so as to have only one gs, she was the one elected. – One would hope that that would be helpful for them. In the CotN, we finally elected a woman as one of 6 general superintendents a couple of quadreniums ago. However, she has since retired, and no other women have served in that position. A number of ordained women in our church (and I’m guessing TWC) have moved to the UMC, where at least they will be assured of having some appointment. Well said , Jeremiah!! “Be the change you wish to see in the world” Your lovely wife is a great example of that …and awesome of you to support and speak out on this !! Amen to you both!!! My wife is a great example of the gift that women clergy are to the church, as you well know! This is such a well thought out and expressed post. Thanks for such a clear hearted and sane perspective. I agree with your post and pray that current elders and board members are able to sense the Holy Spirit and look at their objections to women in leadership roles. Surprisingly, our church has had two women pastors and one local prison chaplain. I think the final step would be a female senior pastor, but as you noted, many people are do not approve of women ministering in areas other than “women issues” (or worship and children’s ministry). Thanks for your thoughtful post. Because I am a woman I was given the title ministry director, while my fellow staff members (men) were ordained pastors. I had just as much (or more) theological training and education and experience however I was the wrong gender to be ordained. Although this hurt deeply for many years, I still maintained my position because I loved the ministry. I eventually resigned because my department needed to be led my a man so that my department would be heard and represented in those elder meetings. My decision to resign was the best decision for the church however the grief I continue to carry is all consuming at times. Thank you for the post. Well written and well thought out. I’m so sorry, Rebecca. You are the stereo-typical example that I was addressing. It’s wrong and unjust. I suspect that most women in your position sense that it is wrong, but they love the church and want to serve. I can only imagine how painful it must have been to see the ministry that you had built do well only after you left and for this reason (even if, like a parent, you were glad to see it succeed). Excellent post Jeremiah. Going to share via Twitter. Thanks. To begin with, I should say that I am PRO-women’s ordination! So, I agree with the conclusion that the article comes to, but I disagree strongly with much of what is said/some of your assumptions. 1) You explicitly equate not ordaining women with “bigotry”. You wrote, “The existence in the secular world of bigotry against women cannot be denied. But there is no place for such an attitude in the Body of Christ.” The problem is that if one understands ordained ministry in such a way that only males should be ordained, that does not necessarily imply bigotry. If God made the world in such a way that he chose only men to be ordained, then it’s not bigotry to do so. It would be obedience to God. Claiming that all churches/denominations that do not ordain women are bigots is absurd and offensive! 2) You wrote, “This is a justice issue.” I couldn’t disagree more. Certainly, there are some who have real problems with women and inappropriately try to keep them down. But, believing that God ordered the world in such a way as to dictate that only men should serve him as ordained ministers is not a justice issue. A woman priest in my denomination recently spoke to a group of women priests and specifically repented for her part (in the ‘70s) of claiming that women’s ordination is a justice issue. It is not a justice issue; it’s a calling issue. 3) A clear assumption displayed in this article (though not explicitly said) is that ordained ministry is the basically same as other forms of ministry. I don’t know of many people who don’t recognize clear and God-given gifts for ministry among women. But, that is different than saying that women should be ordained just because God has given them gifts for ministry. Not all men who have been given gifts for ministry are called to be ordained. First of all, you are right, I intentionally confused the matter of ordination and women’s leadership. The truth is that the only thing that is about ordination is the title and image. That was to make people pay attention. But the article is about women being equal to men in ALL areas of leadership in the church. I happen to come from a denomination that has ALWAYS ordained women and my wife serves one that has for about 90 years or so. Ordination isn’t really the issue for me. I happen to think that we need leadership equality even after ordination conversations are done. Given that you are from the ACNA, you may in fact be right about 2 and 3 within your fellowship. What I did not say is that none of this would be compelling to the Roman Catholic discussion. Their position is on other grounds. Knowing what I do of the ACNA, it wouldn’t surprise me that your argument are somewhat like the Catholic ones. If in fact God ordered the world in that way, then you would be right, denying it would not be bigotry, unjust, or out of the will of God. I would suggest that the biblical argument (of Wright and others) is compelling beyond reasonable doubt. I realize that others will disagree, but that is why I wrote the article. I think to disagree on this issue is to be out of the will of God. I may in fact be wrong. Fortunately I don’t have to the power to declare it for the ACNA. So my response to you would be yes. It is a calling issue. And based on the biblical evidence I would suggest that some women are called to be ordained and lead at the highest levels of leadership just as some men are. If one accepts that the biblical evidence is in support of women in ministry (ordained and all other kinds of leadership) as I do, then it is a justice issue. While I have a lot of respect for the writings of N.T. Wright, I think your evaluation of his paper and condemnation of those who do not agree as being “out of the will of God” is too much. (I did read the N.T. Wright paper) Even N.T. Wright admits “That’s a lot of ‘perhaps’es. We can only guess at the dynamics of the situation – which is of course what historians always do. It’s just that here we are feeling our way in the dark more than usual.” I don’t find his argument compleling beyond reasonable doubt. So there is no discussion, no debate, N.T. Wright “infallibly” speaks for all protestants. (forgive my sarcasm here, but we tend to mock the Catholic church for doing this.) I don’t think this is helpful for the discussion. I would suggest you engage the writing of Dr. Wayne Grudem in his Systematic Theology text and lets have a discussion. Or I would recommend “Women in Ministry: Four Views” edited by Bonnidell and Robert Clouse for more discussion of the ideas surrounding the issue. In no way did I imply that NT Wright infallibly speaks for all Protestants. I simply gave his paper as one easily intelligible summary of the majority scholarship on this issue. Am I saying there should be “no discussion” or “no debate”? Absolutely not. I’m a theologian after all. That is what we do. What I’m saying is that this debate has gone for long enough that persons that still prohibit women in leadership should know that they are going against the majority of biblical scholarship on the issue. And I’m suggesting that there are ethical implications and practical consequences for such a decision. I have read Grudem and the “Four Views” book. In fact I have read about 25 other scholarly monographs on the issue. I do not find the complementarian argument (Grudem’s or others) compelling. And I don’t think others should either. BTW, I fully acknowledge that I may be wrong. But I don’t think I am. Just as Grudem doesn’t think he is. So of course, his ilk think that I am out of the will of God as well. as one who has read grudem, and the other “ilk” (love that btw) and also NT Wright….Great Response! Loved it! As a Nazarene (a Wesleyan-holiness form of Methodism), pastoring in the UMC, and president of the Wesleyan-Anglican Society, I agree with you on both your “pro-women’s ordination” & your critiques. Good thoughts on the topic and thanks for posting. I would like to add that I think the idea that there is a clergy class that women need to be allowed into causes inequality in the Church as well. Every true member of the Body is clergy. It’s not some separate class to be attained. I think a lot of the time we get off topic when campaigning for women’s rights in Church leadership. I am a huge proponent for women’s equality within the Church, but I think the way that happens is to make all of the Church equal. Not by allowing women to be part of the higher levels of leadership, but by getting rid of the idea that there are higher levels. I think the issue is not just about allowing women more access into the system as it currently stands, but it’s about making the system more reflective of Christ, and the fact that He wanted all members of the Church to be equal. Thanks, brother. May I ask your interpretation of passages that encourage followers to obey leadership? I understand the idea of living by walking in mutual submission but there are still passages that directly describe leadership as needed for the bodies survival. As best I’ve been able to understand, those passages have more of a meaning of “be guided by” than “obey,” as in the idea of people ruling over others. I’m no language expert so all I have to go on is what others who know the language say, but that does seem to coincide most with what Jesus said the kingdom should look like (Matt. 20:25-28; 23:8-9 etc.) I believe we are called to follow leaders in the Church when we see they are being led by the Spirit, not because of titles or positions. I just believe leadership is fluid, not resting continually with a specific person or group all the time, and that at certain times certain people are leaders and at other times others are. Everyone can be a leader in their sphere depending on how the Spirit is using them, and everyone should be willing to be a follower to anyone else as long they are being led by the Spirit and showing the character of Christ. We must constantly keep in mind that kingdom leadership looks different than the world’s idea of leadership. And the leaders who follow Christ are not the one who demand others obey, they are the ones who obey. As best I can tell, to be a leader in the Church doesn’t require position or power, in fact it seems to point more to giving up those things like Jesus did. I hope that answers your thoughts and question, I have a lot of directions I keep thinking about going in, but don’t want to get too off subject. For Alan Childers: I’m curious how you understand bishops/overseers and presbyters/elders who were ordained in the NT under apostolic authority, and how you understand the role of the apostles, themselves. It is clear from Scripture that every Christian is a part of the ierateuma (priesthood) of believers, but it is also clear that not all are bishops/overseers or presbyters/elders (who, for example, are appointed by Titus in every city, under the authority of Paul, and who are called to “rule well” in the church). – I’m not calling for a “superior class” of Christians, however, the Scripture does seem to make clear that not every member of the Church is clergy, as that word is defined with any sort of meaning. I had the privilege to serve with a senior pastor who is a woman for three years, and I would be willing to go toe to toe with anyone who claimed she was not called or fit to be a pastor based on her gender. I fully affirm that God calls women, that they should be ordained, and that there is injustice along the lines of gender in the clergy. However, I did always struggle with what I believed and with how I understood what the Bible said. I greatly appreciate the N.T. Wright article that you linked to, because it really helped clear up much of the creative tension I had between believing the authority of scripture and that women should be ordained. Excellent post. Thank you, Jeremiah, for using your voice to be an advocate for women! We women need voices like your’s out there! Thanks for sharing this.it high time women realize their call to serve the lord.JOHN:20:14-18;the first person to be commissioned by jesus himself to preach the gospel of jesus’ resurrection was a woman.Yet it has been a big struggle for women to be ordained as ministers in the church. Women’s ordination has done nothing to promote the church; it is a degradation. These arguments, all from cultural relevance and a cultural notion of “fairness,” apply equally well to same-gender marriage. If Galatians 3:28 is to be the new “clobber text,” then start lining up the male-male couples and marching them down your aisle to the strains of Wagner. If that makes you queasy, and I daresay it does, then consider whither your cheap, unbiblical cultural relativism is leading you. As to “dittoing” N. T. Wright, do your own homework. As for my homework? I have a PhD in theology and have read about 25 monographs in addition to articles, websites, etc., on this subject. You would do well to do the same. It seems to me there is a connection between female ordination and gay marriage. If a woman can take a man’s place in the church, why can’t a man take the woman’s place in the household? Men are to be the heads of their households and the leaders in the church. This was ordained at the beginning: woman was made for man and not the man for the woman. The woman is the suitable helpmate for the man. The devil’s work is to confuse these God ordained roles, as he did in the Garden. He continues to do this. Those who allow this to happen are bringing disorder and confusion on many levels and this leads to destruction. Thankfully nothing can ultimately prevail against Christ’s church and the Lorf is using these issues to separate the wheat from the chaff. This is the folly of worshiping a book written by ignorant sheep-herders 2000+ years ago. There are far too many “Edmunds” in the Christian church, and it will be your religion’s undoing. Certainly not interested in worshiping any book, but curious as to which book you are referring to having been written by ignorant sheep-herders 2000+ years ago. That doesn’t seem to describe any book that I’m familiar with. “I no longer believe that women’s inclusion in all levels of leadership is an option – it is a must. It is biblical. it is culturally necessary. It is just. It is needed to the church’s future. ” Rev.Jeremiah Gibbs. Is it Biblical? Some of us aren’t entirely convinced that it is Biblical. Some of us still would recite 1 Corinthians 11:2-16, 14:34, and 1 Timothy 2:11-15 as evidence. Some just prefer sticking with the voice of the entire tradition of the church which has never accepted women to be priests (debatably has accepted women deacons). You are going the opposite extreme of Roman Orthodoxy ironically which insists those who accept women’s ordination aren’t connected at all to the Church. How is it necessary for the future of the Church? I would love that explained as well if you could. Ironically, I just directed a Bible study this week on 1 Corinthians 11. You do realize, don’t you, that the context of the whole head coverings issue in that chapter is public worship where men and WOMEN are praying and PROPHESYING, right? Further, as chapter 12 indicates, the Spirit gives gifts (a number of which are vocal) for the upbuilding of the Body of Christ, for the common good, according to the Spirit’s choosing. There, there is no indication that the Spirit only gives the verbal, vocal gifts to men, and we already know from chapter 11 that the gift of prophecy is given to both men and women. This is consistent with Peter’s proclamation of Joel’s prophecy on the Day of Pentecost. So, how ever one understands 1 Cor. 14:34, it must be in a way that is consistent with Paul’s claims in 11 that at least some women are preaching just like some men. I understand 1 Cor. 14:34 to be a prohibition against women giving the homily. Why would you just accuse me without even asking me what I believe? That is not what Jesus would do. I never said the Spirit only gives verbal gifts to men either. That also misrepresents my position. But if you are simply going to hurl accusations at me than this discussion is probably over before it even started. I’m just doing my best to follow the teachings of the Bible and the historic Christian church on this issue. I’m sorry, but could you quote one line of “accusation”? Where is there any accusation at all? I replied to your post which said, “Some of us aren’t entirely convinced that it is Biblical. Some of us still would recite 1 Corinthians 11:2-16, 14:34, and 1 Timothy 2:11-15 as evidence.” While the other passages you cited prohibited women speaking in worship, I pointed out that 1 Corinthians 11 indicates that they are prophesying (i.e., proclaiming God’s Word) in worship. I further stated that however one interprets 14:34, it could not be in contradiction to 11. – I said nothing about your views on the gifts of the Spirit, but pointed out that verbal/vocal gifts were given by the Spirit without reference to gender (also indicating that women are less than silent in worship). – All of this was in response to your stating that “some of us aren’t entirely convinced that it is Biblical,” and then your references which included 1 Cor. 11. It felt to me like you jumped to the conclusion that I support these verses as referring to universal silence. I am not God so I don’t know the accurate interpretation of these texts. Some might disagree and allow a women to give an homily even in Catholic services. IDK how to really interpret these texts. I have read LCMS articles which appeal to these texts restricting women’s ordination. I was not saying specifically that I agree with their usage of these texts. My godmother even appeals to these texts when arguing against women’s ordination. So it felt like you were accusing me. Glad we could clear up the misunderstanding. Love the insights on your blog BTW even though I’m not entirely Wesleyan in my theology. Though I appreciate all of your comments, I won’t respond to them all. This one is a particularly uncareful reading of my post so I will respond to that. First, to say that the mounting evidence today (the depth of biblical evidence for a revised position, the wholesale shift in culture, and the need for women’s ministry in the church) is undeniably for womens ordained ministry (and ministry at all levels) is not the same as saying that all others should be excommunicated. Its not to say that earlier fathers and mothers were similarly responsible given the evidence available to them. Rather, it is a judgement of this one particular theologian (in a rather Protestant fashion) to not formally fellowship with those that decide otherwise. I was (at one time) considering whether the ACNA/AMiA churches were the place for me. Their denial/ambiguity on this issue made that untenable. Similarly, while I sent my son to a Catholic school for a while and still worship with my Catholic students regularly, I could not become Catholic (celibate preisthood would also be a barrier for me). None of these people are outside “my church”,-as if any such thing could exist. But, in my judgement these churches have missed the will of God on this issue. Of course, they believe that I have. That is a much less ultimate claim than you think I am making. I too would recite I Cor 11 and I Tim 2, though i believe they say something very different than you apparently do (as you know from my articles). As you also know, I doubt the authenticiy of I Cor 14:34-35. FWIW: I too value the tradition, not infallibly but at least believing it to be Spirit-led. This is the one area where I think even the 2nd century Christians missed the egalitarian (for lack of a better word) Scriptural impulse. Why is it necessary? I’ve already said. This position has always been an error. But in a world where women serve as presidents, CEO’s, AND PRIESTS (in other traditions of Christianity), the prohibition on women’s ordination and leadership is missionally untenable. Though I have not acknowledged it as such in this post, this argument is not convincing to the Catholic argument. I have recognized this in previous discussions though I dont remember where I’ve written as such. The argument you cite from Balthasar and the role of tradition in Catholicism aren’t addressed. I suppose that these kinds of arguments make it impossible to change the RC position. That makes me very sad since I otherwise love the RC very much. It does seem to me like you are excommunicating other Christians when you assert that this issue is not an option. Many non-theistic scholars also conclude 1 Cor. 14:34-35 is not in the original canon. The church says otherwise. I see tradition as quite an infallible interpreter of scripture. How they could’ve possibly missed something we didn’t see is beyond me. It doesn’t make me sad at all that the RC’s position is unchanging as I’m not at all convinced Christianity should kow-tow to culture. I do not have time to address the full role of tradition in this debate other than to emphasize that if you don’t accept the tradition, you in effect have no Bible left over to work with. I’ve experimented with that as a liberal Protestant. Dr. Gibbs, it would be necessary to point out at this point that not every “Christian” (you seem to not consider Catholics, Orthodox, and my own species of Anglicans as Christians in the full sense–that’s okay, neither do we consider you one in the full sense) is convinced that this is a matter of justice. Han Urs von Balthasar takes the position that the role of the priest is to reflect Christ’s role as a bridegroom to the church in administering the eucharist (that would be a theological argument, not a justice argument, against women priests). C.S. Lewis would contend that men reflect God the Father to the people and that a male priest reflects the maleness of God (not entirely certain I agree with Lewis). But the overall point is that most opponents of women’s ordination to the sacerdotal priesthood see this as more of a theological issue than a justice issue so stating it is a justice issue grossly misrepresents other Christians. Liars shall not inherit the kingdom of Heaven regardless of whether they were on the “right” side of women’s ordination or not. That’s it. This whole argument seems fishy. You’re saying Christians who had to practice their religion in secret because it was against the Roman Law had no power to change these systems?!? These were people that were willing to DIE because it was illegal to practice their religion! Your whole set of arguments is unconvincing. Sorry. Funny…St. Epiphanius of Salamis said the same thing about those who ordained women. Honestly, Gibbs. We can’t rely on “Bible alone” to settle this issue and we certainly have to avoid politically charged arguments if we are going to decide what the “right” view on this issue is. I for one am not convinced that either side is right though I certainly believe that Tradition, Scripture, and Theology are against those in favor of women’s ordination. I would highly encourage you to read these two articles I wrote on this subject. The way I read your article, shouldn’t the title be “4 Reasons Why NOT Ordaining Women Is No Longer An Option”? Thank you for this article post. I am a woman who is ordained as a Pastor, but over the years I have had to go pretty much outside denominations. At the moment I feel called to help heal emotional wounds and spiritually uplift women. But my main calling is a Shepherd or in other words , Pastor. I have been Pastor to two small group churches, in an area where there were more male Pastors within the churches. Now I live in an area in a different state and the major denomination in the city is one where women can not be ordained or be called a Pastor. Women have a passion for God, are gifted to preach, and have been serving in the church for centuries. I have prayerfully considered creating an ordaining body and help more women become Pastors. I’m not sure if I will do that but the thought surely has crossed my mind. I hate to see amazingly gifted women left out of the Pastoral ministry because they are women. Thank you again for your post!